All of these problems are generally fueled by two drivers; human overpopulation and over-consumption. We envision intact native ecosystems with their full complement of wildlife and plants. We work for a day when prairie dog colonies can once again stretch across unending expanses, pulsing with the life prairie dogs make possible, from furnishing burrows to salamanders, mice, snakes, and burrowing owls; to creating grazing grounds to pronghorn, elk, bison; to furnishing prey for hawks, badgers, eagles, and so many others. We aspire to a new day, where people appreciate the coyotes, mountain lions, and black bears that hang on in our midst and understand the solace that natural places provide for an increasingly urbanized culture. Many dangers threaten our landscape of life, including urban sprawl, conversion of natural habitats to crops and energy production, dense networks of roads, proliferation of non-native species, and pollution, just to name a few. These threats, in turn, reduce habitats and connectivity between populations of native plants and wildlife. Obstructed connections can reduce gene flow, diminish resilience, and result in species extinction. Modern consumptive habits can mean the loss of native habitats which are increasingly sliced up for oil and gas production and coal mines; streams and rivers depleted or degraded by the livestock industry; and our planet’s climate thrown out of balance by the release of greenhouse gases. Even some forms of recreation cause harm: for example, off-road vehicles trample desert tortoises, compact soils, and cause erosion. Powerful interests intolerant of change are obstructing solutions to these threats. All of these problems are generally fueled by two drivers; human overpopulation and over-consumption. Imagine a colony of black-tailed prairie dogs. It is somewhere on the grasslands of the Great Plains, which sweep from southern Canada, through a vast swath of the U.S., to northern Mexico. 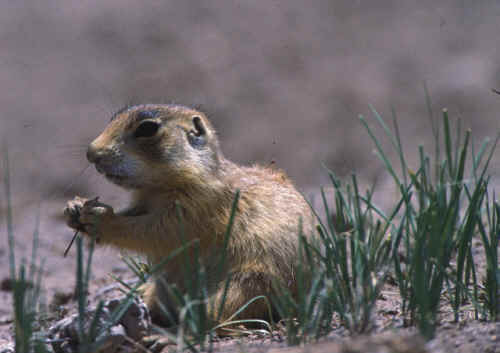 The prairie dogs, sociable animals, pop in and out of their networks of excavated tunnels, keeping watch for predators and communicating with a complex system of yips and barks. If you look closer, you will see why they are considered a keystone species in this ecosystem: the colony is rich with the diversity of species that depend on them and their burrows. Predators including the endangered black-footed ferret, the swift fox, the golden eagle, and the ferruginous hawk hunt the prairie dogs for food. Other animals use their burrows as home and shelter from the midday heat: snakes, cottontail rabbits, burrowing owls, beetles, and salamanders, to name a few. The nutritious vegetation in the colony is kept neatly trimmed, providing fertile foraging for grazers such as bison and pronghorn. Now imagine that this colony was one of the vast prairie dog towns that existed in the 1800s, before Europeans began to settle and drastically transform the Great Plains. It might have stretched for miles, covering many thousands of acres and containing millions of prairie dogs. The extent of it would have been mind-boggling, like one of the enormous flocks of passenger pigeons that also existed at that time. And indeed, the black-tailed prairie dog seems to be traveling down the same bleak path as the now-extinct passenger pigeon. Black-tailed prairie dogs have been poisoned, shot, plowed under, and bulldozed out of up to 99% of their historic range. Current colonies are miniscule compared to the towns of the past. Now they face the additional threat of introduced sylvatic plague, which can lead to 100% mortality in a colony. Despite their imperilment, they have no federal protection. In fact, the Environmental Protection Agency recently approved new poisons for exterminating prairie dogs, which are having devastating effects on both prairie dogs and associated wildlife. 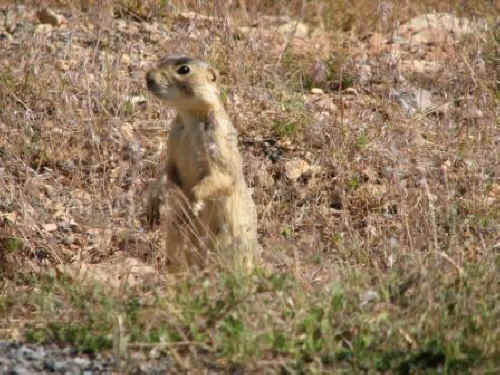 The Fish and Wildlife Service acknowledges that enough poison was sold at a single South Dakota bait station between 2004 and 2008 to cover all occupied black-tailed prairie dog habitat in the United States, with enough left over to poison an additional million acres. Black-tailed prairie dogs are at the heart of the American grassland. As ecosystem engineers, they bring to life our native wildlife and plant communities. To protect our rapidly disappearing grassland heritage, WildEarth Guardians has pressed for protection for this species under the Endangered Species Act (ESA) for a decade, but the Fish and Wildlife Service declared them "not warranted" for listing in 2009. WildEarth Guardians will not stop until this imperiled and important mammal is listed under the ESA. Drama at the Gunnison’s prairie dog colony: one of the prairie dogs on watch spots a coyote approaching. She lets out a short, sharp bark to tell the other prairie dogs what is headed their way and how fast it is approaching. The others respond by instantly bolting into the complex series of burrows they call home; the coyote lopes past the suddenly empty stretch of prairie in search of easier prey. Gunnison’s prairie dogs live in family groups called clans, organized into colonies with their neighbors. Their social structure and complex series of calls allows them to warn each other of predators, such as the coyote, badger, golden eagle, and ferruginous hawk, that patrol their range in the ‘‘Four Corners’’ region of northern Arizona, southwestern Colorado, northwestern New Mexico, and southeastern Utah. They are considered a “keystone species” because of the important role they play in their grassland habitat: as well as (unwillingly) providing meals for predators including the endangered black-footed ferret, they lend homes in their burrows to a host of other animals including snakes, cottontail rabbits, burrowing owls, beetles, and salamanders, to name a few. The nutritious vegetation in their colonies is kept neatly trimmed, providing fertile foraging for grazers such as bison and pronghorn. But this intelligent, social, and important animal is almost gone from its former range. In 1916, they protected colonies across 24 million acres of the Great Plains – now they occupy less than 500,000 acres, a decline of almost 98%. Mass extermination efforts, federally orchestrated on behalf of the livestock industry, began their decline. Currently they are under siege from introduced sylvatic plague, rampant oil and gas drilling, shooting, poisoning, urban sprawl, and other perils. 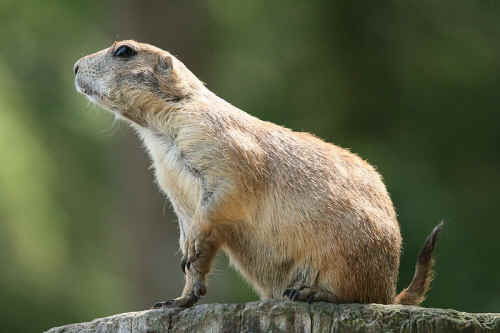 Utah prairie dogs, as their name implies, are found only in Utah and have the smallest range of any prairie dog species. They are true hibernators, sleeping through the coldest winter months. When they emerge in the spring, if they want to pass on their genes they have to work fast – females are only interested in mating for a few hours, one day out of every year. This smallest of prairie dogs shares the role of keystone species with its larger cousins the black-tailed prairie dog and Gunnison’s prairie dog – they are food for predators including the kit fox, the golden eagle, and the ferruginous hawk, and their burrows are home to snakes, cottontail rabbits, burrowing owls, beetles, and salamanders, to name a few. More than 150 wildlife species benefit from the rich habitat prairie dog colonies create. There are less than 10,000 adult Utah prairie dogs left out of a population that numbered nearly 100,000 in the 1920s, before control programs ran their course. They occupy less than 15 percent of their historic range, and their decline is mainly due to intensive poisoning efforts. Utah prairie dogs continue to suffer from habitat destruction for residential and agricultural development, plague outbreaks, and deliberate poisoning and shooting. Despite the fact that the Utah prairie dog is listed as Threatened under the Endangered Species Act, there is a Fish and Wildlife Service (FWS) special rule on the books that allows up to 6,000 Utah prairie dogs to be shot every year – more than half of the entire remaining adult population! The recovery program for this species focuses on relocating prairie dog colonies out of the way of destructive human activities. The problem is, fewer than 10 percent of these critically imperiled mammals survive the move. The Utah prairie dog’s listing as Threatened, though powerful, is clearly not enough to protect a species that faces not only habitat destruction but also active human persecution. WildEarth Guardians launched an effort in 2003 to secure upgraded protections for this species by petitioning FWS to reclassify it to Endangered status and throw out the shooting rule. WildEarth Guardians will not rest until the Utah prairie dog gets the full protection it needs and deserves.